We’ve fully recovered from the DRA’s first gathering and auction, which took place last Saturday, February 11, at the Ecotrust Building in Northwest Portland. We were blown away by the support we received at the event–the building was packed to capacity with DRA supporters, and it was a true honor to host so many old and new friends. Emcee John Hazel and Auctioneer Grant Putnam. Photo by Dave Moskowitz. Steve Light, of Freebridge Brewing. Photo by Dave Moskowitz. 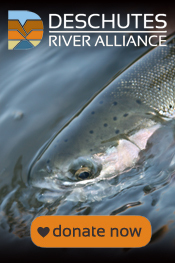 This entry was posted in Deschutes River Alliance News, Events and Presentations, River Thoughts, Thank You, Uncategorized and tagged Deschutes River, Deschutes River Alliance, DRA Board and Staff, Lower Deschutes River. Bookmark the permalink.